click, trash a rezzed piece of ice: Gain 4credit. FFG worked overtime to make Security Subcontract as unplayable as possible. We've all heard that spending for a is one of the least efficient actions in the game and Security Subcontract is potentially even less efficient than that. NOTE: I assume that 1 card is worth a to draw, even though the corp might have received it from the mandatory draw. This is because tempo matters and both players need 'win' cards that get them closer to winning the game, whether it is Agendas, flatline combo cards, Icebreakers or run events. Playing a Hedge Fund spending a card and for 4 only gives an efficiency of 2/ because the corp still needs to draw a card directly helps to 'win' the game. It costs to draw and a second to install Security Subcontract. It also costs to draw and install each piece of ICE, not counting s spent on installation and rez costs. It then costs another to trash the ICE. So assuming 0 were spent installing and rezzing the ICE, then it costs to gain 4, an efficiency of 1.33 not counting the cost to draw and install Security Subcontract. If you count those costs then it actually cost to gain 4 for an efficiency of 0.8, which is clearly worse than just clicking for credits in the first place. After trashing 2 pieces of ICE the corp will break even, having spent 8 s for 8 s. After trashing 3 pieces of ICE the corp has spent 11 s for 12 s, finally turning a 'profit'. To put things into perspective, those 11 s represent almost 3 entire corp turns. In the meanwhile the runner has probably installed some breakers, a Medium or R&D Interface and scored at least one Agenda from runs. Now in order to get a free ICE install the corp will either install on servers with no ICE (so probably not containing anything valuable) or have a scored Eden Fragment which is a unique 5/3 Agenda. In order to rez this ICE you will probably want to use the in faction Executive Boot Camp (a good card) which even gives you a 1 discount. Lastly you will need to fill your deck with cheap ice like Pop-up Window, Ice Wall, Quandary and Hunter and then add more 'normal' ice so you can actually protect your servers. The worst thing about security subcontract is the question of timing. It most likely comes into play when you are either really broke or need to have more s than the runner. In both cases it eats up valuable s on the turn when you probably need to spend your actions on installing things or SEA-Scorching your opponent. If it was similar to Aesop's Pawnshop and didn't cost a per use it would be barely usable, as it currently stands using Security Subcontract is worse than clicking for credits. The only 'beneficial' use for this card is tricking inexperienced Whizzard players into wasting a to trash it. Another Weyland Core set card that has seen almost no use. 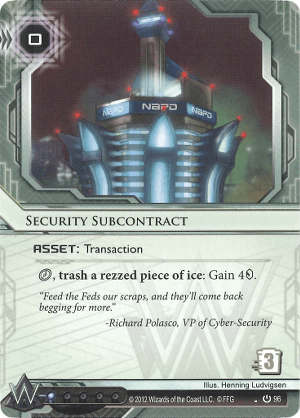 Security Subcontract is a very interesting card that may see some use as new ICE such as Little Engine comes into play. ICE that is good for a while, then a huge drawback once the runner has the tools needed. The main problem is that even if the ICE is not stopping the runner, its taxing them, even if that tax is only a credit or two. Once that ICE is rezzed it’s not costing the corp any money to keep it up, but it costs the runner every time they go through it. With ICE like Little Engine however, there comes a point where the runner is probably breaking even to get through it, making it not even worth as a tax. If there is more ICE like this that is worth playing, Security Subcontract could be worth a slot to at least get some of the money back. Of course, because the corp can just trash ICE whenever they install new ones on that server, which not only removes the problem, but also gets a new piece of ICE that may actually tax the runner, is usually a far better choice than a simple four credits.